This week marks the final week of regular season play for Clinton County and both the Lady Dawgs and Bulldogs are hoping for deep runs in the post season. All that depends on what happens in the first round of the 16th District Tournament which will be held next Monday for the boys and Tuesday for the girls. On Monday night, February 18, the Bulldogs will take on number four seed Cumberland County. Clinton County earned the number one seed this year by defeating all other district opponents on both the home and away games, putting the Dawgs at 6-0 on the year in district play. Cumberland County, the number four seed in the tournament, went 0-6 in district play with losses to Metcalfe County, 74-67 and 97-90 in overtime; Russell County, 76-72 and 69-64; and to Clinton County, 84-75 and 85-73. Metcalfe County, taking the number two seed in the tournament, will play on Tuesday night, February 19, against Russell County. Both Metcalfe County and Russell County won each of their respective games against Cumberland County, but split on games against each other. In the first match-up on December 10, 2018, Russell County defeated Metcalfe County, 70-62. The two teams played again on January 29, 2019 with Metcalfe County pulling out the win, 56-53. With Metcalfe and Russell County winning one and losing one against each other, combined with each having two wins against Cumberland County and two losses against the Bulldogs, both Russell and Metcalfe went into a tie with 3-3 records. A coin toss was made in order to determine which team would be the number two and three seed in the tournament. The district tournament will be held at Metcalfe County this year with the Dawgs’ tipoff scheduled around 7:30 p.m.
On the girls’ side, Clinton County posted a number three seed and will play number two seed Russell County on Tuesday, February 19 at 6 p.m.
Clinton County defeated Cumberland County in both games, 51-32 and 43-33, while losing both games to Metcalfe County and Russell County. During the Russell County games, Clinton County only lost by five points, 36-31, in the first game and lost 62-45 in the second game. Metcalfe County defeated the Lady Dawgs in both outings 78-41 and 67-43. Russell County and Metcalfe County split their games with Russell County winning the first meeting, 69-54, but losing the second meeting between the two teams, 70-59. With each of those two teams splitting regular season, a coin toss was performed in order to have a clear number one seed in the district, with Metcalfe County winning the toss. Both Russell and Metcalfe counties finished with 5-1 district records while Cumberland County finished with an 0-6 district record. 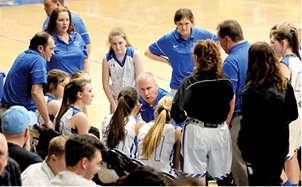 Clinton County girls’ basketball head coach Darrell Thompson, kneeling center, uses a time out in a recent game to give instructions to his players. The Lady Bulldogs will play Russell County in first round action of the 16th District Tournament at Metcalfe County next Tuesday night, February 19, at 6:00 p.m. The Bulldogs’ 16th District Tournament first round debut will be Monday, February 18, at 7:30 p.m. when they face Cumberland County.